A French 2-3/4 inch early 19th-century style frame, with individually-colored floral carving at the corners, separated sloping outer panels and a light twisted-rope decoration toward the inner lip. The finish shown is yellow clay with blue, violet, green and red clay. 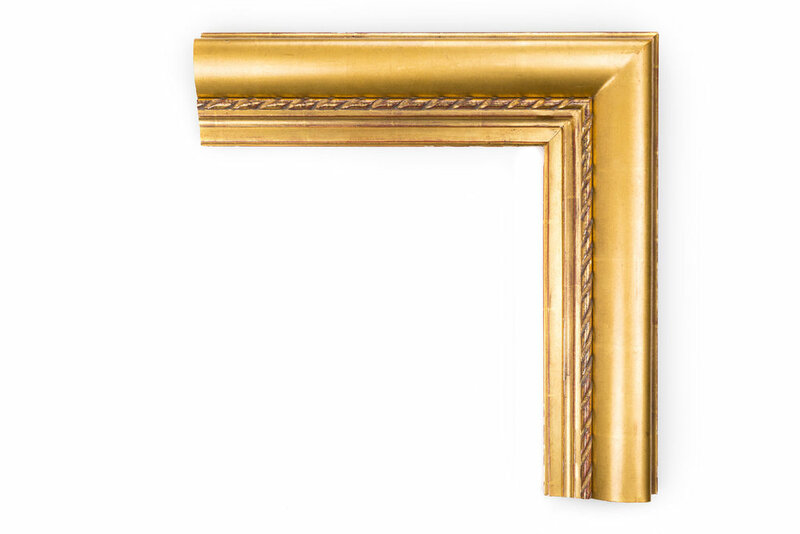 A French 3-3/4 inch Romantic-era frame, with a soft open slope from the outer edge, beaded decoration and a rounded, sloping inner liner. The finish shown is matte yellow gold with a dark red clay. A French 2 inch Neoclassical-era frame, the center high cove is decorated with anthemion palmettes along the sides and corner. The finish shown is yellow gold with a red clay. 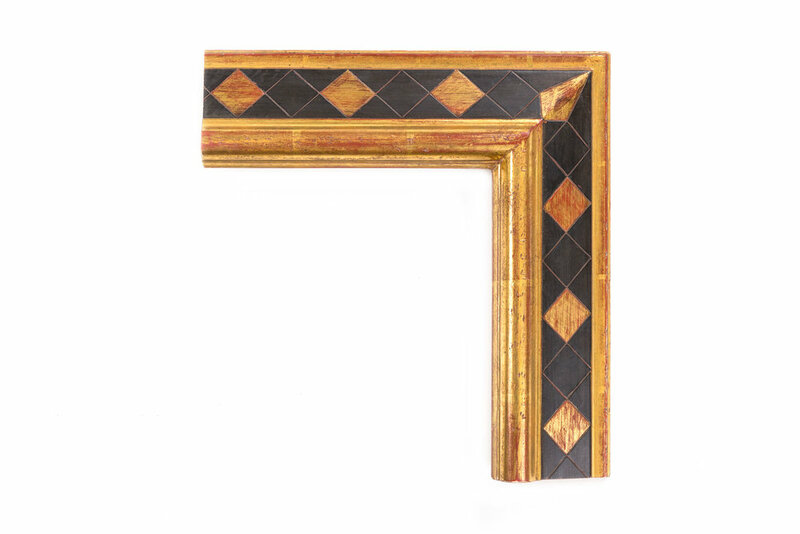 A French-inspired 2-1/4 inch frame style adopted by English frame makers in the 19th century, this ornate frame has sweeping hand-carved elements at the corners and centers reminiscent of Chippendale furniture makers, and kidney-shaped cartouches along the cove. The finish shown is yellow gold with a brown wash and red clay. 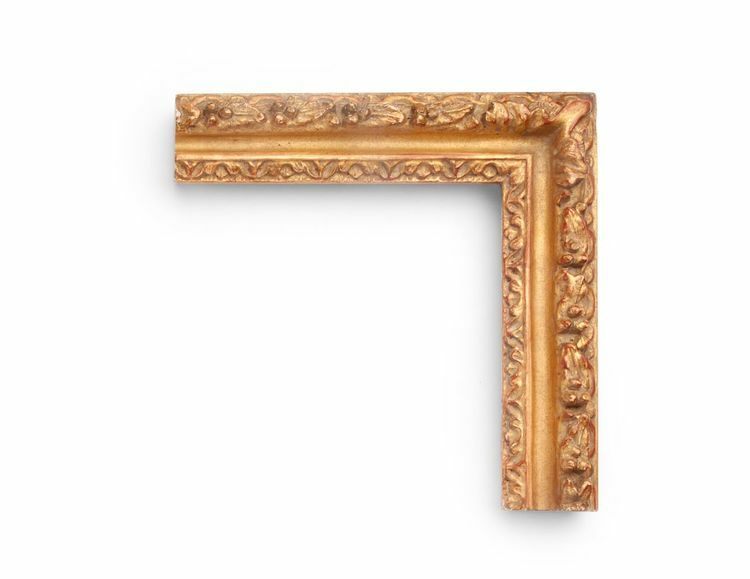 A French-inspired 1-1/2" English Regency-era frame, this narrow frame features carved rails meeting at floral-and-shell decorative corners and centers, fluting along the cove, and decoration on the outer and inner edges. The finish shown is yellow clay with a deep antique finish and red clay. A French 3-3/4 inch Louis XVI-era frame, with lambs-tongue decoration on the outer lip, a flat center panel, and an irregular-bead pattern on the inner lip. The finish shown is yellow gold with a heavy antique finish and red clay. A French-inspired 4-3/4 inch Barbizon-style frame adopted by the American school, with tall outer floral decoration and cross-hatching, center cove, and floral inner lip. The finish shown is yellow gold with a blue clay. A French 1-3/4 inch Louis XIII-era frame, with hand-carved floral decorations and crosshatching at the corners, sanded center panel, ornate decoration on the inner lip, and gilded sides. The finish shown is yellow gold with an antique finish and a red clay. 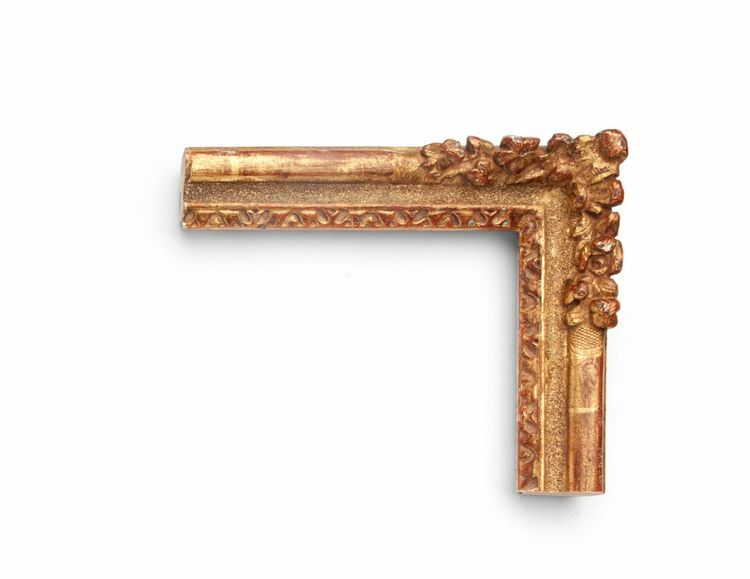 A French 3-1/2 inch 18th-century Baroque-style frame, this ornate frame has sweeping floral decoration throughout, along the rails, centers and corners. Everything is fully hand-carved. The finish shown is yellow gold and a red clay. A French 2-1/4 inch Louis XIII-era frame, with center cove and floral carving throughout. The finish shown is yellow gold with a red clay. This is a small sample of our selection of French frames. Come in to see more.